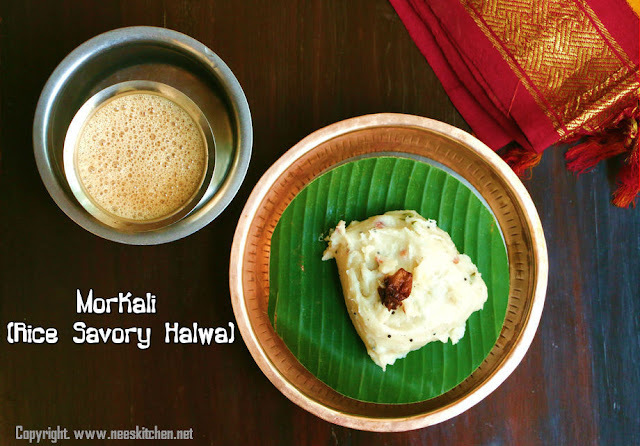 MorKali or Rice Savory Halwa is a dish made with rice flour and buttermilk. We generally take it as tiffin in evening. My mom is a specialist in this dish. The dish has halwa consistency but in childhood we would prefer to make it a bit crispier in the bottom part as it would taste very nice. To make it crispier & darker (Kaandhal) we need to add a lot of oil but now a days since I am bit concerned on diet I asked my mom to skip this part. Maida is added to this dish. I generally do not use maida in any of my dish but since it is my mom’s cooking I have included this time. Maida is still optional for this dish. This dish consumes a lot of oil if cooked in gas stove. I generally make the morkali with ragi/millet flour however the rice flour one is the original version. Cooking in a pan needs a lot of patience as we need to keep mixing the dish continuously without forming any lumps. I generally do it in microwave as it is much easier. I will be publishing the ragi morkali very soon. 1. Mix the ingredients in the “To mix & soak” table. Add butter milk & water little by little so that no lumps are formed. It should be completely water. Add more water if needed. Soak it for 8 hrs. 2. After 8 hours add the chopped curry leaves and coriander to the soaked mix. 3. Take a non-stick pan and temper in the ingredients given in order of “To temper” table and roast them until a good aroma comes out. 4. Add the soaked rice flour & butter milk mix. 5. Keep mixing continuously without forming lumps. 6. Once it starts to thicken keep adding 1 tsp of oil in regular intervals until you finish the 1tblsp oil. 7. It slowly forms a halwa consistency. When you take water and touch the dish it must not stick to your hand. You may wish to stop here or leave it for some more time so that the bottom portion becomes crisper and darker (Kaandhal). 8. Optional step – take a plate and grease it with oil and cut them into pieces and allow it to cool down for few minutes. This dish can be served hot or in room temperature. 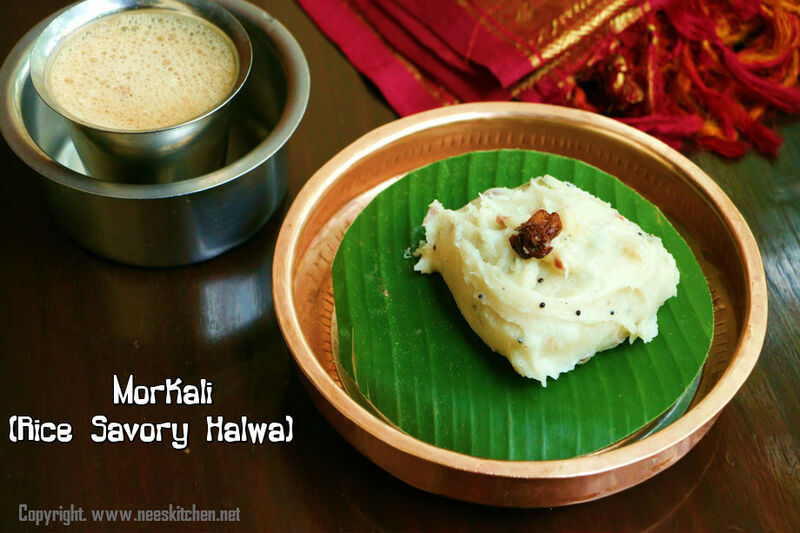 It goes well with mormilagai, however you dip it with milaga podi (idli chili powder) also. Oil can be added more if you need it to be crisper. You may add some more mormilagai.